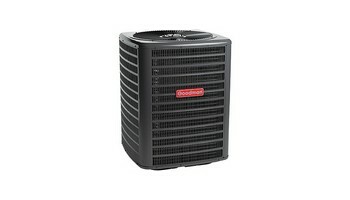 Goodman is one of the biggest names in home cooling, heating and energy-efficient home comfort. That’s because Goodman lives up to its name in a big way, with time-tested energy-efficient technology, highly durable materials and spot-on manufacturing. So, no matter where you live or whether your home is small or large, Goodman probably has a solution to help keep your home comfortable. The best air conditioner is the kind you don’t have to think or worry about. It comes on the moment you need it and then runs quietly and efficiently all year long as needed. The Goodman DSXC18 is loaded with features designed to provide outstanding performance for years to come. They use advanced techniques and materials so you know the cozy, even temperature you feel in every corner of your home is an energy-efficient trend that’s designed to stay for many years.There complete line of air conditioners are priced to help add comfort to your budget from a local independent Goodman dealer. And that’s only the beginning. They want you to smile every time you open your utility bill, so they design energy efficient technology into our units. Goodman brand heating and cooling systems are designed to provide refreshingly affordable and energy efficient indoor comfort solutions using advanced technology. But the company ultimately adheres to some old-fashioned values, too. Goodman believes in the integrity of the American worker. That’s why Goodman brand heating and cooling systems are designed, engineered and assembled in the United States. Complete warranty details available from your local dealer or at www. goodman mfg.com. To receive the 10-Year Unit Replacement Limited Warranty, Lifetime Compressor Limited Warranty (good for as long as you own your home) and 10-Year Parts Limited Warranty, online registration must be completed within 60 days of installation. Online registration ,The best heat pump is the kind you don’t have to think or worry about. It comes on the moment you need it and then runs quietly and efficiently all year long as needed. The Goodman DSZC16 is loaded with features designed to provide outstanding performance for years to come.In particular, your Goodman brand GSC13 Energy-Efficienct Air Conditioner will provide you with reliable cooling at money-saving energy efficiency levels as compared to lower SEER units. Benefits of this high-quality air conditioner include: • An energy-efficient compressor • A high-efficiency condenser coil made of corrugated aluminum fins and rifled refrigeration-grade copper tubing • A factory-installed in-line filter drier Add to that a 5-Year Parts Limited Warranty* on all functional parts, and you have an air conditioner that offers what they believe to be one of the best product values in the industry.They take pride in our manufacturing processes and build each unit carefully. They rely on strict, quality-driven processes to build well-designed, top-quality and thoroughly-tested products. They leak-test every air conditioner three separate times during the manufacturing process, and we run-test each unit before shipment. This quality focus insures a trouble-free installation and a long product life. “SEER” stands for Seasonal Energy Efficiency Ratio, which is a measure of an air conditioner or heat pump’s cooling energy efficiency developed by the U.S. Department of Energy. It’s a simple formula: the higher the SEER of your unit, the greater its efficiency – and the lower your operating costs. Older installed units in many homes have operational efficiencies of 8.0 SEER or even less. In many cases, these lower SEER units can really inflate the electric bill. When properly matched and installed, your new Goodman brand GSC13 Air Conditioner offers efficiencies that provide significant savings compared to lower SEER units.